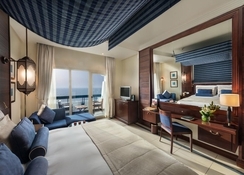 A sunshine holiday with a host of luxury touches is never far away when guests choose to stay at the Ajman Hotel Ajman. This impressive hotel is ideally located on a private beach, providing guests with their own peace and tranquillity during their stay. All rooms have been designed to incorporate the views that surround them while guests will find that they have plenty of dining options during their time at the hotel. 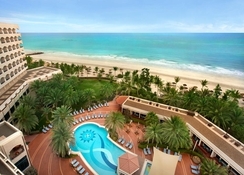 There is also plenty to do here as there is a spa, a fitness centre, a kid's club and access to an exclusive golf course. 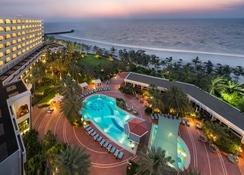 The Ajman Hotel Ajman is a real treat, tucked away in a quiet location overlooking the Persian Gulf. The beachfront location and private setting enable guests to grab some time to themselves during their holiday in the sun. With access to a 500-metre private beach, sunbathing and crystal-clear waters are always within easy reach. However, for those guests who prefer to explore can head into the city centre where they will find a host of shops and restaurants while the esplanade just outside of the hotel is the ideal spot for a leisurely stroll. Keen golfers can also book a round of golf at the local golf course. The airport is 14km from the hotel. There are 180 guest rooms at this impressive hotel, giving keen travellers the chance to book either a Sea View Room or a Sea View Suite. All rooms are well-appointed and are designed with subtle touches and wooden features, creating a warm and welcoming atmosphere. Guests are never left wanting as all rooms come with a host of facilities including air conditioning, TV, minibar, telephone, Wi-Fi, safe, hairdryer, magnifying mirror and a luxury bathroom with bathrobe and slippers. Guests can discover an array of culinary delights when they dine at the hotel. There are four restaurants to choose from with Cafe Naseem offering a buffet-style dining experience while Bukhara delivers a taste of India with an array of delicious Indian dishes. For those who love Italian cuisine won't be disappointed because Sabella's serves up a great choice of dishes with authentic Italian flavours. For beachfront dining and an idyllic setting then the Zanzibar Restaurant serves up an extensive seafood menu. The hotel also offers an impressive selection of bars with a total of seven stylish venues. Guests can grab a drink at the swim up bar during the day, relax in style at the lobby bar or have some fun at the sports bar while the Blazon Lounge provides an executive experience. For bowling lovers, the Cosmic Bowling bar serves up a great choice of drinks and a licensed bowling alley. 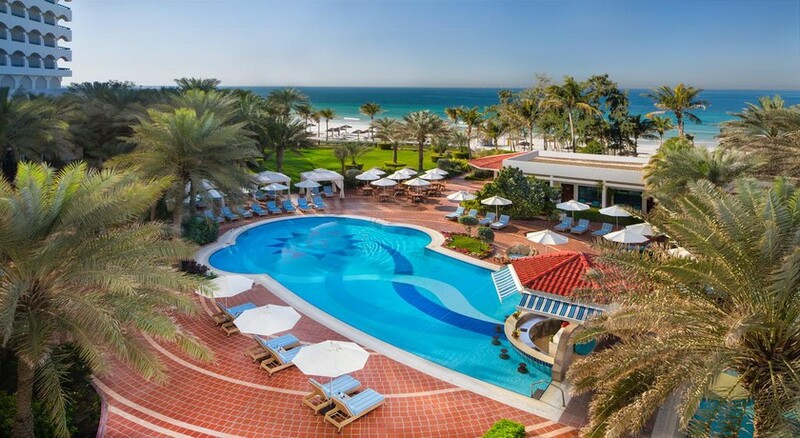 There is plenty on offer at the Ajman Hotel and guests can begin their day by lazing by the large pool before taking a dip and ordering a drink from the swim-up bar. There is plenty for the little ones as there is a pool and a kids’ club for them to enjoy. Guests can unwind at the spa and take their pick from a choice of treatments and massages while those who like to work out can head to the fitness centre where they will find a fully-equipped gym. For those who love to play golf, guests can take advantage of special guest rates at the Al Zorah Golf Club.